New Winter 2018: This four-piece drum set ornament will wow any drummer with its authentic good looks and attention to detail. This is a high-quality wood decoration complete with perfectly styled pedal, lugs and cymbal, and it comes to you in our one-of-a-kind velvet ornament bag. 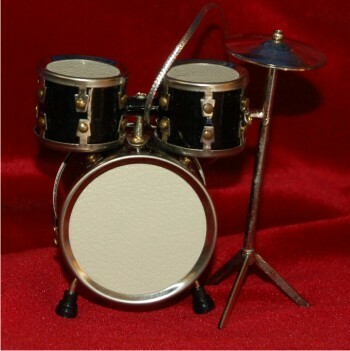 You can add a name and a year to the drums personalized Christmas ornament to commemorate getting a first drum set or landing a first professional gig. Complete your band with other pieces from our diverse musical instrument ornaments collection. Christmas Gift Nov 13, 2015 Jaymie S.
gift Feb 17, 2015 Jenifer M.